When the Electrician came it was certainly a learning experience. One thing was for sure, and that was the fact that there was no need for an electrician. Only the most un-handy people should call to have an outlet installed. Essentially there was conduit* run along the ceiling in the basement of the building, in order to give the wire an osha approved route to the new 220 volt outlet that would reside about 25 linear feet away from the circuit box. Laying out the conduit was an easy task, sometimes a bend needed to made in the conduit, or a clip needed to be screwed into the ceiling – but overall it is a very simple and extremely basic task, imagine routing a water hose around a few corners and nailing it to your ceiling. After he routed the conduit, then the three wires were pulled through, this again is only a matter of pushing the (very rigid) wires through the newly secured conduit route. There were three wires to begin with, a positive (red), a negative(black), and a neutral(green). These wires – once pushed through were then fastened (hard-wired?) into the circuitry of the units electrical panel, which consisted of making sure the switch was in the OFF position, and then putting the red to one of the contacts, the black to the other contact and the green to the grounding area, which is a separate area that looks like an aluminum strip with many holes drilled into it – opposite the actual black panel of switches. Again, this was what was thought to be the dangerous part that would decide fate, but as long as you make sure your switch is in the OFF position there is nothing to worry about. So the wiring is in place in the electrical panel, the conduit is up, the three wires are through the conduit and coming up to the new outlet. While the circuit switch is still in the OFF position complete the outlets wiring, which is surprisingly self-explanatory. However where it gets confusing is that the wire (cable, it’s a very large set of wires – four of them) coming off and out of the actual motor had four wires. The Brother DB2-B791-015 has (had) a 4-wire (2-pole) connection for the outlet wiring. Therefore it had a red, black, green, and white wire underneath it’s sheath. The red equals positive, the black equals negative, the green equals ground, and the white equals neutral. This was simple in theory except for the fact that a 4-wire male plug was almost inexistent. No hardware store or larger home improvement center had such a thing. Online there were supposed 4-wire male outlets, but they were not of the 2-pole type. Introducing the next question, apparently the poles are part of the 2, 3, 4, wiring question. So while it was possible to find a 4-wire – 3-pole male outlet plug, there was no such thing as a 4-wire – 2-pole male outlet plug. From this experience it is assumed that the 4-wire – 2-pole male outlet plug is an outdated, or outmoded system. This may be due to the difference between 110 volt outlets and 220 volt outlets and whether or not 220 volt outlets were the common thing when this particular motor was considered the most latest of servo motor technology. All of this of course is a complete mystery and any questions are usually three part questions. The answers to these questions are few and far between. In an effort to provide some relief of the presser foot mishap, perhaps it is a good time to recap the original Brother DB2-B791-015 dilemma, which spurred the weblog in the first place. What prompted this all in the first place is/was the motor. The Brother was purchased with a Mitsubishi Limi-StopZ servo motor, that after many tribulations had to be replaced. You can see it here in all it’s glory. 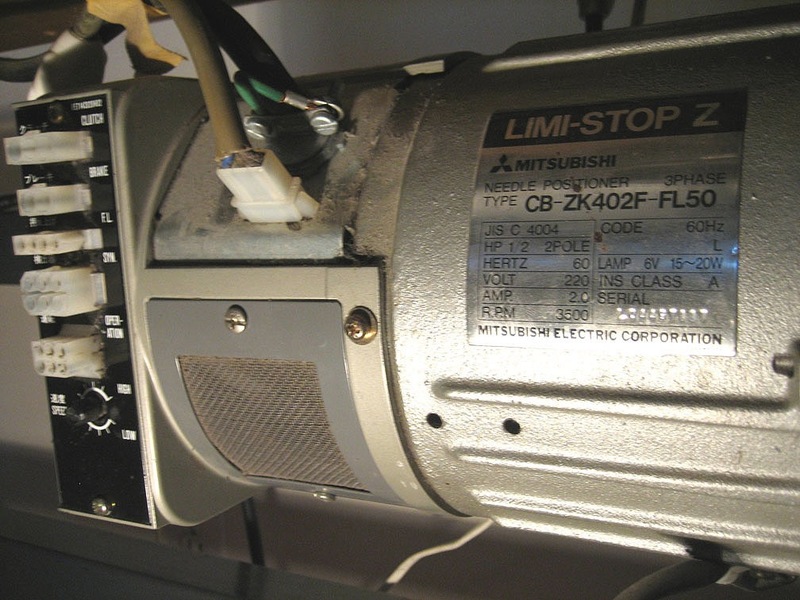 To really flush the story out, it is necessary to begin at the first obstacle of the Mitsubishi motor, the fact that it is a 220 volt appliance. The placard on the motor clearly says this and it was no surprise at the time of the purchase, however it was a misleading issue. After having the Brother in the house for a few weeks, and pouring over information on how to install a 220 volt outlet, it was decided that hiring an electrician was the safest thing to do. The first reason was obvious, no one wanted to be electrocuted in the process of wiring it. As could be seen, the job would be a matter of first figuring out where in the living quarters the Brother would reside. Clearly this was a big question because of where the electrical box was in relation to it, and how much conduit would need to be routed in order to supply power to it. Fortunately the living quarters are directly over the basement where the electrical box is located, this would save the routing from interfering with any other people in the building. The closet that housed the furnace was a likely spot to drill through the floor and provide a place to have the outlet, which is why in this picture the Brother is on a different wall than in some of the early posts, it had to be close to this closet for access to the conduit coming in from the basement so it would not be aesthetically obtrusive anywhere else. Plus the wall space was free. So after relocating the machine (with the casters this is a simple task), the electrician came in to complete the wiring. To continue with the first issue of the Brother, a second image of the motor is in order. 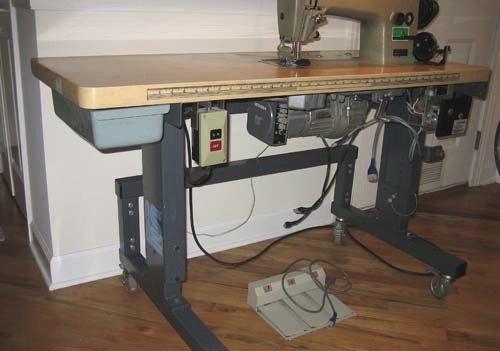 When the Brother first arrived it was seemingly a simple set up, the first thing that needed to be done was to install a 220V outlet, which would hopefully be enough to power the feed, automatic presser foot lift, and automatic thread trimmer. Unfortunately, this was not the case at all. It took about 3 weeks to finally commit to installing the 220V outlet, which during that time a lot of simple lessons were learned. The first thing to come to attention was that the machine head did not have an automatic thread trimmer, much time was wasted learning this. The second thing to be revealed was that – considering it is only a straight feed machine – there is no back tack, or bar tack mode, and of course no zig-zag stitch. All of this is fairly uneventful but it brought up a larger question; Why did the Brother DB2-B791-015 head have such an outstanding motor if it would only be able to take advantage of the automatic presser foot lift?